The global ethylene propylene diene monomer (EPDM) market is marked by the rapid influx of a number of small- and medium-sized companies, sustained rise in demand from industries such as automotive and construction, and shifting preference from conventional to bio-based products. A constant rise in the numbers of construction projects and rising demand for public and private vehicles in developing economies has compelled EPDM manufacturers to align their expansion strategies towards these regions. Transparency Market Research states that the global EPDM market will expand at a CAGR of 5.4% over the period between 2016 and 2024. The market, which had a valuation of US$2.63 bn in 2015, is expected to rise to US$4.20 bn by 2024. While growth prospects are mostly positive for the market, fluctuation in raw material costs and oversupply of EPDM are expected to hamper the growth of the market to a certain extent in the next few years. Accounting for over 40% share in the overall consumption of EPDM in the global market, the automotive sector emerged as the most promising end-use industry for EPDM in 2015. In the past few years, the automotive sector has witnessed significant traction in developing economies across Latin America and Asia Pacific. A continuous rise in sales of personal and public transport vehicles across these regions has augured well for the EPDM market. EPDM forms a central component in vehicle parts such as belt drives, front and rear bumpers, rear lamp gaskets, inner tire tubes, braking systems, door seals, and interior panels. Over the period between 2016 and 2024, development of the EPDM market will continue to be determined by the growth of the automotive industry. Other key end-use industries that will lead to sustainable growth opportunities for the global EPDM market in the next few years include plastics, construction, and electrical. The EPDM market for the plastics (polymer modification) and construction industries will expand at 5.2% and 5.5% CAGRs, respectively, from 2016 to 2024. Accounting for over 40% share in 2015 in terms of volume, the Asia Pacific emerged as the clear leader the global EPDM market. The EPDM market in Asia Pacific is expected to expand at a favorable pace in the next few years, enabling the region to retain its dominance in the global market over the period between 2016 and 2024. The flourishing construction and electrical industries in the region will contribute to the favorable growth of EDPM. Owing to the presence of a large number of electrical equipment parts manufacturers and a promising construction industry, China will emerge as the chief consumer of EPDM in the Asia Pacific market. Other promising regional markets for the EPDM market include Middle East and Africa and Latin America. The rising demand for rubber and plastic components in the electrical, plastic modification, and automotive industries will lead to sustained consumption of EPDM in these regions over the next few years. In developed regions such as North America and Europe, demand for EDPM will expand at a moderate pace, primarily owing to the recovering automotive and construction industries. The North America EDPM market is expected to exhibit a 3.9% CAGR while the Europe EDPM market will expand at a 3.6% CAGR from 2016 to 2024. In the highly consolidated market, the top six EPDM manufacturers accounted for a collective share of nearly 80% in 2015. These companies are ExxonMobil Chemical Company, LANXESS AG, Lion Copolymer LLC, Kumho Polychem, The Dow Chemical Company, and Mitsui Chemicals. Other prominent vendors in the market are Sumitomo Chemical Co. Ltd., Versalis S.p.A., Johns Manville Inc., and Firestone Building Products Company LLC. Ethylene propylene diene monomer (EPDM) is a synthetic rubber typically manufactured through the solution polymerization process. It is produced using ethylene and propylene in the presence of dienes and catalysts. EPDM rubbers are primarily employed in the manufacture of light weight components such as automotive bumpers and automotive interiors in the automotive industry. Rising demand for EPDM in the automotive industry in various regions is likely to propel the EPDM market in the near future. EPDM is also used in plastics, construction, electrical, and other end-user industries. Demand for EPDM rubbers is projected to increase significantly in the next few years considering the extensive growth of the global automotive and construction markets. Asia Pacific dominates the EPDM market in terms of production and demand. Countries such as China, India, Thailand, and South Korea are expected to be the key consumers of EPDM. Fluctuation in prices of raw materials is anticipated to hamper market growth, as prices of raw materials are dependent on the prices of crude oil and oversupply of EPDM in the market. These factors are projected to adversely affect market growth during the forecast period. Increase in research activities on bio-based EPDM is estimated to offer major opportunities to the EPDM market in the next few years. This report analyzes and forecasts the market for EPDM at the global and regional level. The market has been forecast based on volume (kilo tons) and revenue (US$ Mn) from 2016 to 2024, considering 2015 as the base year. The study includes drivers and restraints of the global EPDM market. It also covers impact of these drivers and restraints on demand for EPDM during the forecast period. The report also highlights opportunities in the EPDM market at the global and regional level. The report includes detailed value chain analysis, which provides a comprehensive view of the global EPDM market. Porter’s Five Forces model for the EPDM market has also been included to help understand the competitive landscape in the market. The study encompasses market attractiveness analysis, wherein end-users are benchmarked based on their market size, growth rate, and general attractiveness. 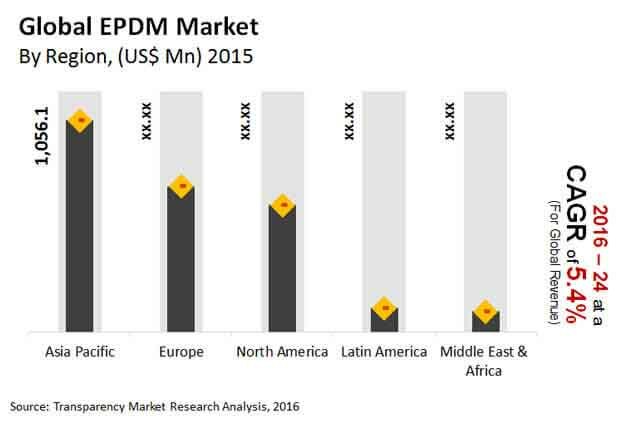 The study provides a decisive view of the global EPDM market by segmenting it in terms of end-users such as building & construction, electrical, plastics, automotive, lubricant additive, and others (including rubber goods). These segments have been analyzed based on present and future trends. Regional segmentation includes current and forecast demand for EPDM in North America, Europe, Asia Pacific, Latin America, and Middle East & Africa. The report provides the actual market size of EPDM for 2015 and estimated market size for 2016 with forecast for the next eight years. The global market size of EPDM has been provided in terms of volume and revenue. Market volume has been defined in kilo tons, while market revenue is in US$ Mn. Market numbers have been estimated based on key end-users of EPDM. Market size and forecast for numerous end-users have been provided in terms of global, regional, and country level markets. In order to compile the research report, we conducted in-depth interviews and discussions with a number of key industry participants and opinion leaders. Primary research represented the bulk of research efforts, supplemented by extensive secondary research. We reviewed key players’ product literature, annual reports, press releases, and relevant documents for competitive analysis and market understanding. Secondary research includes a search of recent trade, technical writing, Internet sources, and statistical data from government websites, trade associations, and agencies. This has proven to be the most reliable, effective, and successful approach for obtaining precise market data, capturing industry participants’ insights, and recognizing business opportunities. Secondary research sources that are typically referred to include, but are not limited to company websites, annual reports, financial reports, broker reports, investor presentations, SEC filings, Plastemart magazine, TPE magazine, internal and external proprietary databases, and relevant patent and regulatory databases such as ICIS, Hoover’s, oneSOURCE, Factiva and Bloomberg, national government documents, statistical databases, trade journals, market reports, news articles, press releases, and webcasts specific to companies operating in the market. We conduct primary interviews on an ongoing basis with industry participants and commentators to validate data and analysis. These help validate and strengthen secondary research findings. These also help develop the analysis team’s expertise and market understanding. The report comprises profiles of major companies operating in the global EPDM market. Key players in the EPDM market are Lanxess AG, ExxonMobil Corporation, Firestone Building Products Company, LLC, Sumitomo Chemical Co., Ltd., Kumho Polychem Co., Ltd., Mitsui Chemicals, Lion Elastomers, LLC, The Dow Chemical Company, Versalis S.p.A., and Johns Manville, Inc. Market players have been profiled in terms of attributes such as company overview, financial overview, business strategies, and recent developments.